(NaturalNews) As more research on the various health benefits of natural foods and ingredients is performed, there are more findings that substantiate what naturopaths and homeopathic healers have known for years. Some of that recent research has focused on the benefits of black cumin seed, and scientists are now able to report that there is evidence they retard growth of cancerous cells and, in fact, is very effective in the treatment of cancerous conditions. 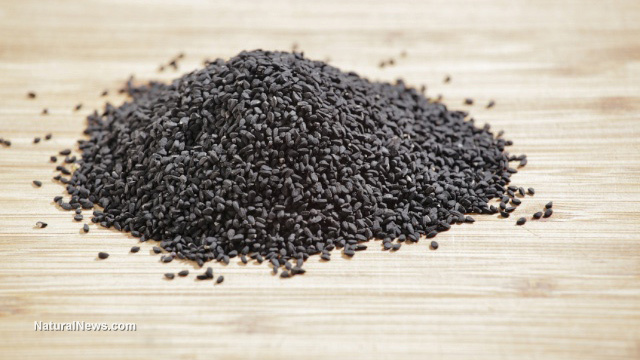 As reported by Healthy Food Place, black cumin seed oil and its extract, thymoquinone, appear to be very effective at battling liver cancer, melanoma, lymphoma, cervical cancer, and pancreatic, bone, breast, stomach, prostate, colon and brain cancers as well. There have been many advances made by scientists in human clinical tests, even with almost no risk of side effects. However, the black seed oil does not get enough recognition from the modern medicine. The fact is, though, that the oil has been used for centuries to treat cancerous tumors. A pair of studies from Chinese and Saudi Arabia in 2011, the site reported, found that the oil has been used for hundreds of years to treat cancer, confirming its cancer-fighting properties. In addition, research has found that black cumin oil can also be effective in the treatment of diabetes, cardiovascular diseases, kidney problems and many other conditions. Scientists do not completely understand yet the mechanisms behind the oil's cancer-fighting qualities, but some studies suggest that thymoquinone has a powerful antioxidant action that reinforces the immune system. But studies have shown that the seed's oil induces apoptosis in cancer cells without compromising the body's immunity. In addition, the oil seems to control the Akt pathway, which helps maintain cellular survival. Unfortunately, modern traditional medicine has yet to catch up to, and accept, these amazing qualities, opting instead for expensive, painful cancer treatments like chemotherapy, surgery and radiation therapy – each with low success rates. The effects of this combination have been examined by Egyptian scientists on oxidative stress and cancer. They exposed 4 groups of rats to a strong carcinogen. Some of the groups were fed with black seeds or honey, and only one of the groups was given both. In 6 months the outcome showed that the groups that ate only black cumin seeds had 80% protection against oxidative stress and formation of cancer, while the group which was fed with both the ingredients had 100% of protection against oxidative stress, formation of cancer, and inflammatory responses. It certainly appears as though most of the research into the health benefits of black cumin seed is being done outside of Western labs. A 2014 Turkish study attempted to find out how the oil helps people who opted instead for radiation therapy; researchers discovered that many of the patients examined experienced severe side effects during and after the treatment. In addition, scientists studied the effect of the oil on irradiated rats. First, the rodents were given a single dose of gamma radiation. Then, one group was given 1 grain of the oil an hour before receiving radiation, then received a 10-grain dose for another 10 days, while another irradiated group was given only saline. The control group was not irradiated. The results showed that the black cumin seed oil "reduces the oxidative stress marker, having potent antioxidant effects. The oil actually protected the rodents from the harmful radiation effects," Health Food Place reported. Another 2012 study from India also explored the effects of the oil in mice that were exposed to gamma radiation. This study also found that the black cumin seed oil has protective effects against damage caused by irradiation and biochemical alterations. To learn more about how natural remedies and healthy, nutritious food can help prevent and fight cancer, be sure to sign up for the FREE Truth About Cancer Summit here.